I just finished reading a brand new book by Lance Gibbs, founder and executive chairman of BP3. BP3 is an Austin, Texas-based company that works with clients to provide simplified and improved business process solutions. 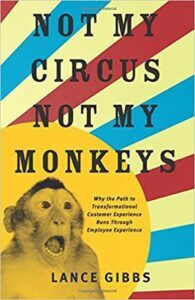 The book’s title, Not My Circus, Not My Monkeys, perfectly captures the challenges large companies face in driving productivity. I often talk about the need to balance the needs of shareholders, customers and employees. Gibbs explores this theme around granting employees the systems, authority, and considerations they need to best perform their work. Too many companies end up neglecting employees and customers in an attempt to chase short-term shareholder value. This strategy inevitability fails over the long term.